The farmer-driven Northern New York Agricultural Development Program is reminding farmers to get orders in for the bio-control nematodes that help protect alfalfa crops from the highly destructive alfalfa snout beetle. 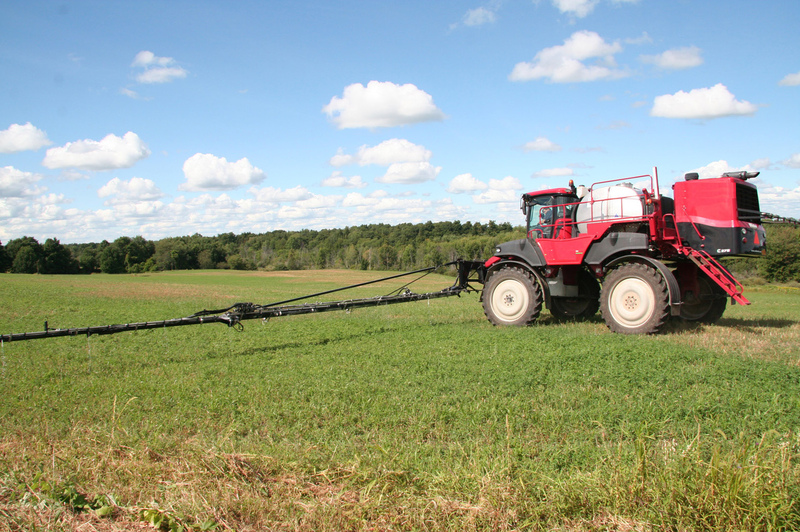 The beetle is considered the single most key factor limiting production of alfalfa as a key feed crop for the dairy and livestock industries in the six northernmost counties of New York State. Most winter malting barley fields in New York have headed out and the remainder will do so this week. Foliar sprays of Caramba or Prosaro up to seven days after head emergence may still result in significant FHB and DON suppression. Fungicide products containing strobilurins should not be applied to headed wheat or barley as they may result in increased levels of DON in grain. A heads emerged spray with these triazole fungicides also helps protect upper leaves against fungal leaf blotches, powdery mildew, and rust. Even though we have had frequent rains, the Fusarium Risk Assessment Map shows mostly low risk of Fusarium infection in New York because temperatures have been considered too low for spore production. This is a critical week ahead for fungicide spray decisions on winter wheat. Winter wheat in New York varies from boot stage to the initiation of flowering. The triazole products Caramba and Prosaro are the most effective fungicides for suppression of FHB and DON contamination when applied at flowering (emergence of anthers on heads). A flowering application of triazole fungicide should be based on Fusarium head blight (FHB) risk as well as the risks of powdery mildew, rusts, and fungal leaf blotches in the upper canopy based on scouting of individual fields. We have observed low levels of powdery mildew and fungal leaf blotches. We confirmed the first stripe rust of the season today on winter wheat in Yates Co.! Foci were fairly large with severe rust in the lower canopy spreading to upper leaves, suggesting a number of rust reproduction cycles in these fields and possible local overwintering of the rust. There is an application window of approximately 7 days from the beginning of flowering in which reasonable FHB suppression can be expected. Check the Fusarium Risk Assessment Tool (http://www.wheatscab.psu.edu/) and your local weather forecast frequently as your winter wheat crop approaches heading and flowering. Last week temperatures ranged from 2 to 6 degrees above normal. Precipitation ranged from a trace to 1 inch. 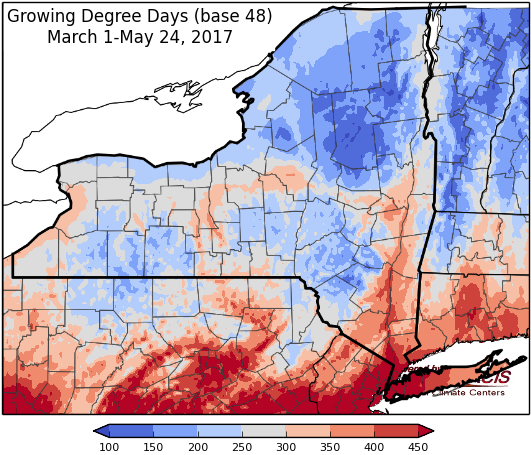 Base 50 growing degree-days ranged from 40 to 100. Today will be cooler than normal with highs in the upper 50’s to low 60’s as a low-pressure system moves in. This will also bring rain and showers to the state. Overnight lows will be range from the mid 40’s to mid 50’s. Friday’s highs will range throughout the 60’s with lingering scattered showers, especially in eastern areas. Lows will be in the mid 40’s to mid 50’s. Saturday will be partly sunny with highs in the 70’s. Overnight temperatures will be in the upper 40’s to mid 50’s. Sunday, highs will again be in the 70’s, but with a chance of scattered showers. Overnight temperatures will be in the 50’s. Monday’s highs will be in the low to mid 70’s with a chance of showers. Lows will be in the 50’s. Tuesday will have temperatures in mid 60’s to mid 70’s with a continued chance of showers. Lows will be in the 50’s. Wednesday, temperatures will be in the mid 60’s to mid 70’s, again with a chance of showers. Lows will be in the 50’s. The seven-day precipitation amounts will range from ¾ “ to near 2.1”. Thursday and Friday’s rain will total ¼ “ to near 1”. Sunday and Monday’s rain will range from ¼ “ to 1.31”. The 8-14 day outlook (June 1-7) favors near-normal temperatures and precipitation. I was out in winter barley fields this week in Genesee, Orleans and Monroe Counties. SY Tepee that was planted earlier (September) is flowering). Those planted a little later were heading out but no flowers yet. Time for fungicide applications! A couple of fields have already been sprayed with Caramba or Prosaro earlier this week. Others will be ready this weekend. Also, scout for insects prior to the fungicide applications. 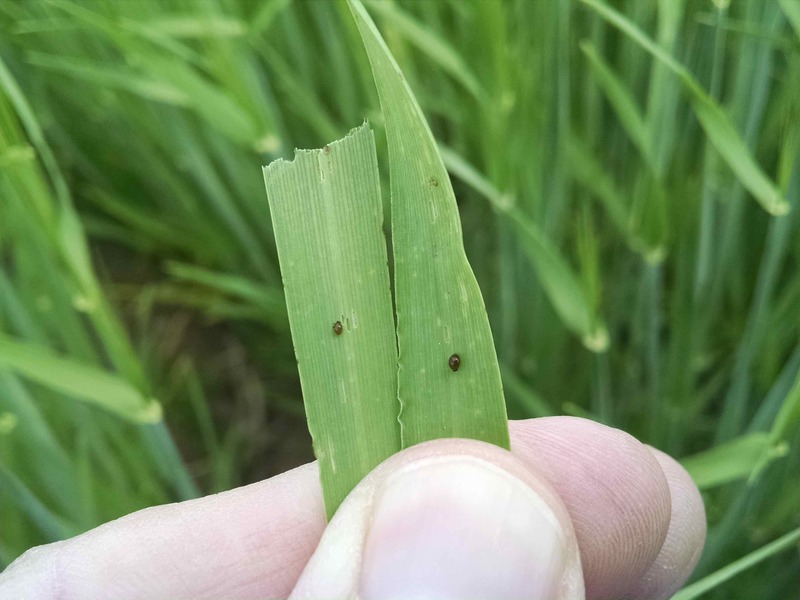 In one field I was able to find Cereal Leaf Beetle (CLB) eggs and larvae that had just hatched (black shiny and 1/8” long). All those that we found were down in the canopy. Eggs are very small, orange and usually on the top surface of the leaf right on the midrib. They are sometimes laid end to end in a row of 2 to 4. Best to spray for them now while you are going over the field with your fungicide. Common armyworms (CAW) could also be a concern right now. We have been catching high numbers of moths in pheromone traps the past couple of weeks. Females like to lay their eggs in grassy fields and winter grains. We are getting reports of very small larvae (1/8” – 1/4”) being found in grass fields in Jefferson County by Mike Hunter yesterday. It is very hard to find them when they are this small. You will have to look at eht bottom leaves of the plant for feeding injury. You will see small pieces of the leaves missing. They are nocturnal and will hide in the dead leaves at the base of the plant during the day. Watch for blackbirds diving into the field. This is a sure sign that CAW are present! Winter malting barley fields in New York range from in the boot to heads fully emerged. Development is further ahead in the Hudson Valley region. Conditions have been very conducive for local spore production by the Fusarium Head Blight (FHB) fungus. The Fusarium Risk Assessment Map has shown moderate to severe risk for large areas of the state this week and through this weekend. Application of an effective triazole fungicide product, specifically Caramba or Prosaro, is recommended as soon as all of the barley heads have emerged to suppress FHB and DON production as well as to protect upper leaves from foliar diseases. Sprays up to seven days after head emergence may still result in significant disease suppression. Fungicide products containing strobilurins should not be applied to headed wheat or barley as they may result in increased levels of DON in grain. Significant levels of scald disease have been observed in some barley fields. Low levels of powdery mildew and spot blotch have been observed, though no rusts have been seen to date. This is a critical time for triazole fungicide application to winter barley and I urge close observation of crop development and weather forecasts. Winter wheat in New York is at stem elongation to flag leaf visible stages, so flowering is still about 10-14 days ahead. 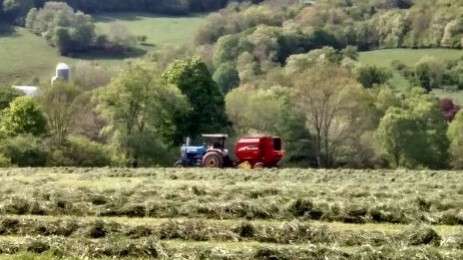 Some wheat is further ahead in the Hudson Valley. The triazole products Caramba and Prosaro are the most effective fungicides for suppression of FHB and DON contamination when applied at flowering (emergence of anthers on heads). A flowering application of triazole fungicide should be based on Fusarium head blight (FHB) risk as well as the risks of powdery mildew, rust, and fungal leaf blotches in the upper canopy based on scouting of individual fields. We have observed low levels of powdery mildew and fungal leaf blotches but no stripe rust or leaf rust to date. There is an application window of approximately 7 days from the beginning of flowering in which reasonable FHB suppression can be expected. Check the Fusarium Risk Assessment Tool (http://www.wheatscab.psu.edu/) and your local weather forecast frequently as your winter wheat crop approaches heading and flowering. 4 Why do Weeds get into the Alfalfa or Clover Fields? Last week temperatures ranged from near-normal to 6 degrees below normal. Precipitation ranged from a trace to 2 inches. Base 50 growing degree-days ranged from 0 to 30. Wind Advisories & Hazardous Weather Outlook for Thursday. Today will be another very warm day with temperatures in the mid 80’s to low 90’s. Showers and thunderstorms associated with an approaching cold front could bring severe weather in the afternoon; primary threats are damaging wind and small hail. Overnight lows will be range from the mid 50’s to mid 60’s. Friday’s highs will range widely from low 60’s in western and northern NY to mid 80’s in southeast NY. There is a slight chance of lingering scattered showers. Lows will be in the 40’s. Saturday will be sunny with highs in the 60’s to low 70’s. Overnight temperatures will be in the 40’s to low 50’s with showers possible in western NY. Sunday, highs will be in the upper 60’s and 70’s with chance of scattered showers, most likely in western NY. Overnight temperatures will be in the 50’s. Monday’s highs will be in the mid 50’s to mid 70’s with scattered showers possible from a passing cold front. Lows will be in the 50’s. Tuesday will have temperatures in mid 60’s to low 70’s. Lows will be in the 50’s. Wednesday, temperatures will be in the mid 60’s to mid 70’s. Lows will be in the upper 40’s to mid 50’s. The five-day precipitation amounts will range from ¾ “ in southeast NY to near 2.3” in central to northern NY. The 8-14 day outlook (May 25-31) shows increased chances for below-normal temperatures and above-normal precipitation.